October 8th 2010, I had an interview with a German metal band Jaded Heart which would play in DORO's Japan Tour. I talked with them in a small back stage room at Tokyo HOLIDAY in Shinjuku before their show. This is the photo on that day. You can see from the left, Michael Muller (Bass), Henning Wanner (Keys), Johan Fahlberg (Vocals), Peter Ostros (Guitars) and Axel Kruse (Drums) in this photo. Thanks to Jaded Heart guys' cooperation of this coverage. Those are the comments below as a band Jaded Heart. First of all we would like to tell you thanks for coming to Japan. Is this your first time to come to Japan? I have heard you just got here yesterday. What do you think so far? Do have you anything particular you want to try in Japan, except the live shows? Look around somewhere or eating something? Yes. Sightseeing a bit and try to have Japanese foods and SAKE more, of course. We had a Japanese dinner last night with other bands and had some SAKE. And then we sang some songs with KARAOKE machine too. Great! 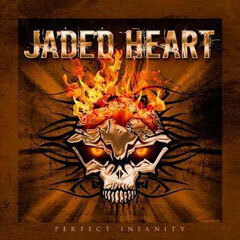 Were there any songs of Jaded Heart? Now let’s talk about your latest album PERFECT INSANITY. Is there any episode on the recording of this album? Everything went on well? Absolutely. Whole recording was always funny. Especially the drum recording! We were just programming and putting it in the computer like this. Just kidding! (laugh) We had a good team. We focused on the solo guitar and vocals this time. Dennis Ward was mastering and Chris Lausmann was mixing for us. Speaking of the album, the cover artworks are so cool. Who designed those for you? We can see your character cartoons at your website. Who drew them for you? Manga Pics? A Japanese guy did it. I got some questions from your Japanese fans want me to ask you guys. The first question is; Who is the strong or heavy drinker in your band? Question #2; Who is the hottest guy in the band? Question #3; Which song is your favorite in all of yours? OMG! 'Sinister Mind', 'Love Is A Killer', 'Fly Away' and 'Hero' … We can't choose it. Question #4; How come you don't make a music video? We did just one 'Hero'. Well, it's expensive to make and our record company can't afford it. Question #5; Do you have any songs in German? No. All our songs we made are in English. Do you have any plans after this Japan tour? We will have writing a song and a recording for the next album. Unfortunately, no live shows. As you already know a singer in GOTTHARD Steve Lee was killed in an accident a couple days ago. Did you have any special friendship with him? We are very sorry to hear that. We feel sad. It was a sad tragedy. We have toured with GOTTHARD. Steve was a great guy and great singer. He was very friendly and too young to die. We have to do something as Jaded Heart. Tribute something. When we get back from Japan, we will just try to get contact with GOTTHARD guys and then ask them. I'd like to have your message to the Japanese fan of you. It's really fantastic! When we came to the other side world, the Japanese people recognized and asked us to give our autograph on the street. Thank you very much for liking our music. Of course we can not meet all the people, we will have only the 3 small shows here. Hope we come back again soon. Domo arigatoh! Thank you so much for the time, guys. I appreciate it. Good luck with the show tonight. Enjoy your staying in Japan.